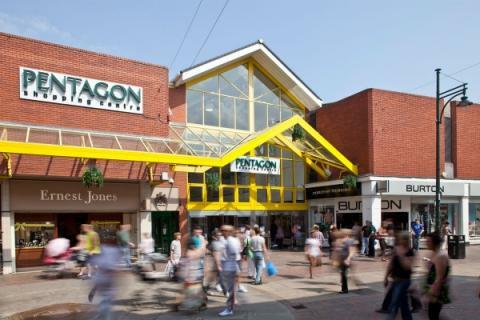 Chatham’s well known shopping centre, The Pentagon, was built in the 1970’s and contains over 70 shops and 1000 parking spaces. It was remodelled in the 1990’s with modern glass elevators, new ceilings and lighting, although the original flooring is still in place. It was bought by BHL for £93million in February 2007 and the Irish investor BHL is said to bringing The Pentagon back to the market at a figure thought to be around £50 million. The 330,000 sq ft mall is anticipated to be marketed through JLL. The Pentagon has some well known anchor tenants; Sainsbury’s and Wilkinson as well as other well known brands. Chatham has a wealth of history and is a strategic centre for trade, but the closure of the dockyards and the recent poor economy has created more challenges for the area. There is urgency for positive change in the area. Medway Council had published a framework for regeneration which included the expansion of the shopping centre floor space. It is recognised that the shopping centre needs investment and an increased diversity of shops to encourage people back to the area. New leisure facilities will increase the sense of community and greatly help to improve the centre as a destination. The parking facility is also in need of improvement to provide additional spaces which are well lit and safe as well as accessible. There does appear to be an impetus for change in Medway with various regeneration plans including Rochester Riverside which will bring more people, homes and jobs to the area. The Pentagon is a key area and ensuring commercial success will be of major importance. We look forward to seeing what this change will bring.